Home / Wink'redible You! / Playing Bingo Responsibly – When is it Time to Stop? As much fun as playing online bingo may be, it is possible to have too much of a good thing. On very rare occasions, bingo loses its appeal as an innocent activity and becomes something quite dangerous. 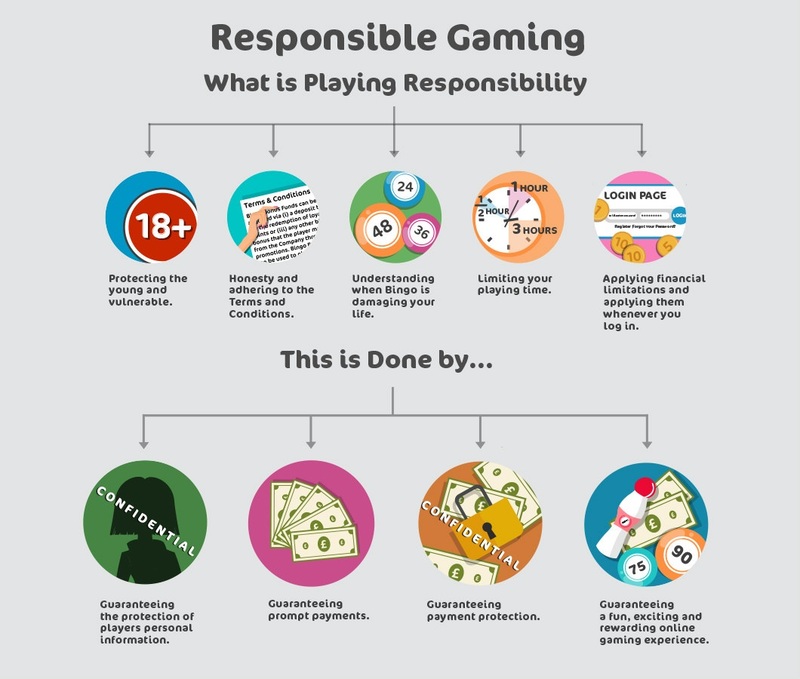 When it comes to online gaming, it’s up to you to understand the risks that can arise when you do not play responsibly. Sometimes things can spiral out of control, and while bingo sites keep an eye on all players and offers them adequate support if necessary, it is a player’s duty to accept when it might be a good time to stop playing. However, how do you know when enough is enough? What are the telltale signs of compulsive gambling? When does bingo cease being fun? This page answers all these questions and many more – discussing in detail everything you need to know about playing bingo responsibly. Within this gambling guide are recommendations about what you can do to fully enjoy playing, what bingo sites do to protect their customers, how to set limits for yourself, how to make sure the wrong kind of people don’t become involved in gambling and also where you can go to talk to professionals about the pitfalls of compulsive gambling. Protecting the young and the vulnerable. Acting within the confines of the law (you must be 18 to play). Being honest from the off and adhering to the Terms & Conditions outlined during player registration. Understanding when bingo is becoming something that’s damaging other areas of your life. Limiting playing time so that other areas of life are not affected. Understanding and accepting financial limitations and applying them accordingly whenever you log on. At Wink Bingo, we encourage and actively advocate the practice of responsible playing and offer expert advice when it comes to keeping members safe and secure whenever they use bingo sites. Guaranteeing the protection of all players’ personal information. Guaranteeing a fun-filled, exciting and thoroughly rewarding online gaming experience for all. Playing responsibly makes bingo what it should be –a good time for everyone involved. 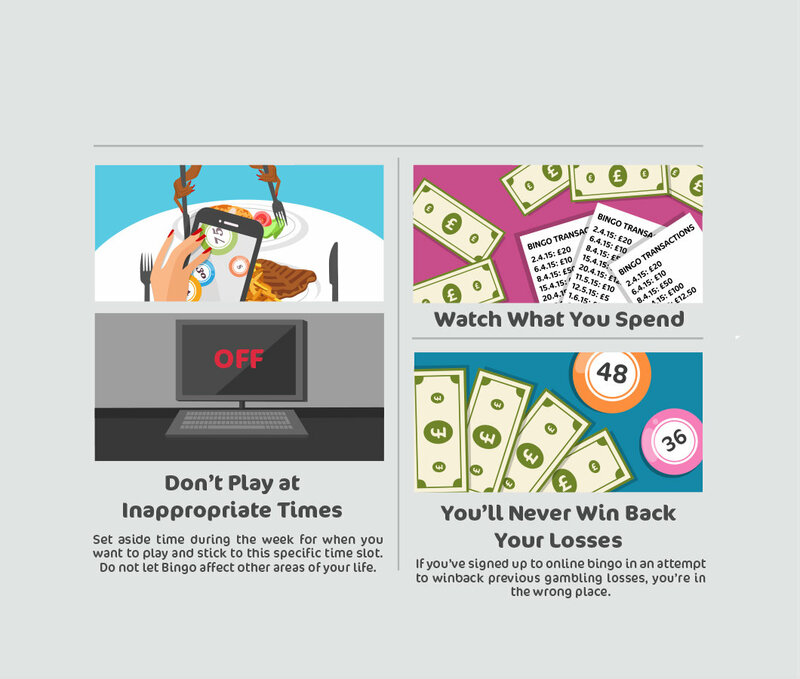 It’s crucial to remember that playing bingo online is not a bad thing. On the contrary, gambling is actually a terrific bond-building activity that has the ability to bring people together from around the world – creating a sense of enjoyment in the process. However, life has a habit of taking unpredictable turns, and online bingo – just like any other gambling activity – is not a pastime that’s exempt from becoming a financial problem for a player. For the most part, bingo sites want to ensure you have a fantastic time when you play, and their admins will be first on the scene whenever irregular activity takes place on your account. If you’re lodging bigger bets than normal, or gambling on a much more frequent basis, site administrators will often weigh in and make sure that everything is okay. There are few things in life more enjoyable than a great game of online bingo but for a small minority of members the act of gambling can spiral out of control and become a serious issue. Luckily, there are steps you can take in order to keep bingo fun and exciting, preventing yourself from falling into the trap of a gambling addiction. Listed here are a few things to consider when you start playing online. Consider them every time you log on, and bingo will remain a fun-filled activity. 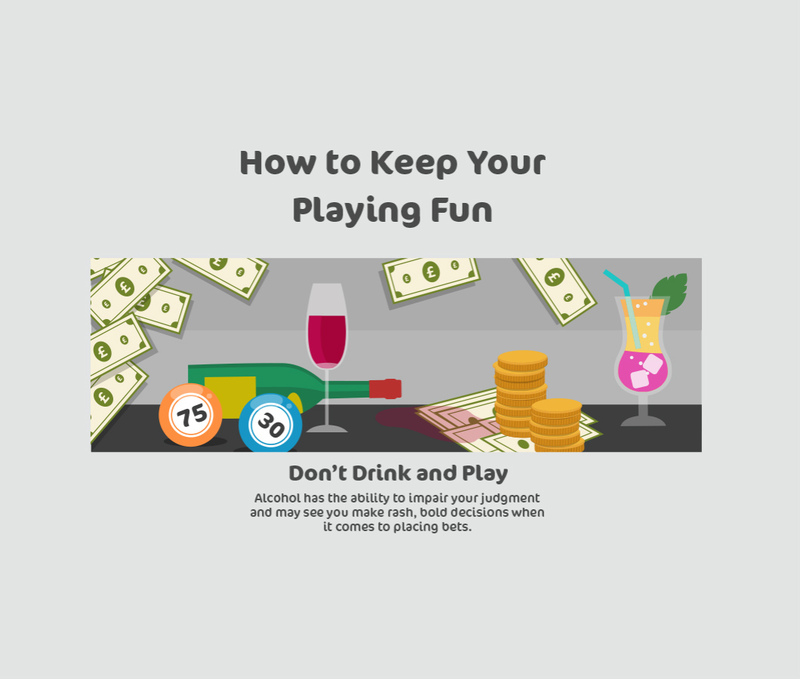 Don’t drink: While your idea of sipping a few cold ones whilst winning big cash amounts playing bingo online might be your idea of heaven, drinking alcohol while playing online bingo is not advisable. Alcohol has the ability to impair your judgment and may see you make rash, bold decisions when it comes to placing bets. Whenever you play bingo, the best way to enjoy it is with a completely clear head. You won’t need any alcohol to have a good time playing, so save the beer and wine for when you head down to the pub. Don’t play at inappropriate times: We know more than anyone how much fun playing bingo can be but like any other activity, there’s a time and a place for it. Playing online at work, during social occasions or at other inappropriate times may cause damage to other areas of your life. Set an hour aside during the week for when you want to play and stick religiously to this specific time slot. You’ll enjoy bingo much, much more if you play in your spare time. Watch what you spend from the off: From the moment you begin playing online,be sure to make a conscious effort to examine what you can afford to spend. Taking the time to work out a playing budget will ensure you don’t slide into financial trouble and will guarantee that bingo remains fun, relaxing and carefree. You can track your overall spending by looking at your bingo account transactions whenever you like. You can discover more about ways to curb your spending habits by examining the “Setting Limits For Yourself” section below. You’ll never win back your losses: If you’ve signed up to online bingo in an attempt to win back previous gambling losses, you’re in the wrong place. Nobody should ever gamble to try to win money back. Bingo should be a form of entertainment and a source of pleasure – not a scheme for recouping losses. One of the best ways to continue enjoying bingo is to set strict limits for yourself. By doing so, you’ll avoid running into financial trouble somewhere down the line and prevent bingo from turning into an addictive and destructive habit. Cancelling your membership on an ordinary website can often be a tricky affair, as companies will do all they can to prevent you from slipping away. After all, the last thing they want to do is lose a customer. With bingo sites, this is often a very different matter. If you ever feel that playing has become more of a chore than a giddy pastime – you don’t need to feel nervous about approaching bingo site admins to close your account. Naturally, the last thing they want is to see you go, but they also realise that when gambling isn’t fun anymore – it’s time to walk away. If you want to close your account, most bingo sites will allow you to do so immediately – offering you links to places where you can find support in the process. If you fear that you will reopen your account at some point in the future and rekindle your dangerous habit, you can ask your bingo site customer advisers about the process of Self-Exclusion. This is a self-banning order that will prohibit you from accessing your account for a pre-agreed amount of time. If you feel like you’re ready to enjoy bingo as an innocent, joyful activity again at some point in the future, they’ll probably welcome you back with open arms – but will also closely monitor your account to ensure you don’t fall back into bad habits. You can also ask support staff to set limits for you. Simply contact one of the site’s customer representatives by e-mail or phone, and mention that you’d like a “time out” from gaming activity. After doing this, your account will be temporarily suspended – allowing you to walk away, gather your thoughts for a few minutes/hours, and eventually approach the game again armed with a fresh and healthy mind set. 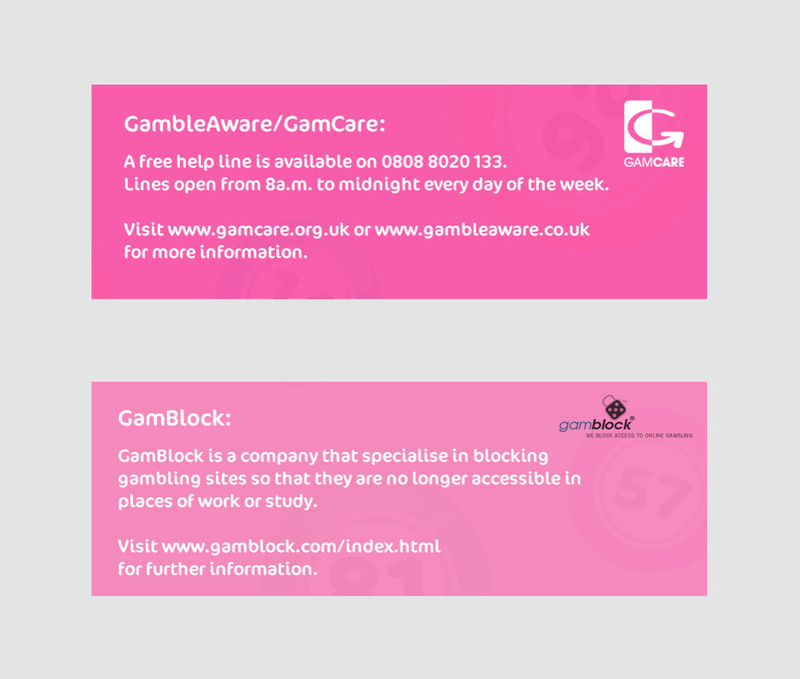 GambleAware/GamCare: A free help line is available on 0808 8020 133. Lines open from 8 a.m. to midnight every day of the week. Visit www.gamcare.org.uk or www.gambleaware.co.uk for more information. GamBlock: GamBlock is a company that specialise in blocking gambling sites so that they are no longer accessible in places of work or study. Visit www.gamblock.com for further information. Gambling Therapy: Gambling Therpy offer support for anyone affected by the fallout of irresponsible gambling. Visit www.gamblingtherapy.org for more information. 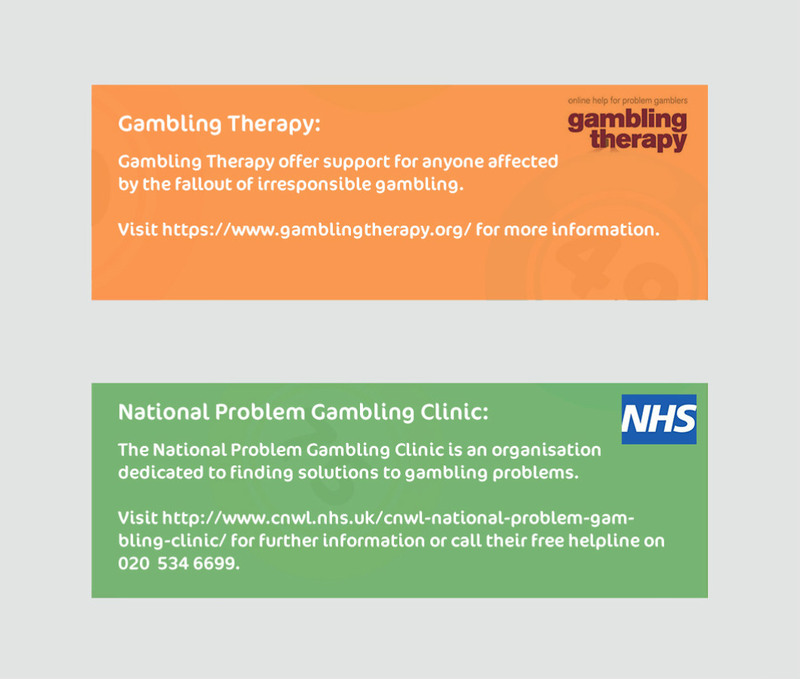 National Problem Gambling Clinic: The National Problem Gambling Clinic is an organisation dedicated to finding solutions to gambling problems. Visit www.cnwl.nhs.uk for further information or call their free helpline on 020 7534 6699. Gamblers Anonymous: Gamblers Anonymous UK is a place where people can go to share their thoughts and feelings about gambling with fellow men and women who have encountered issues due to irresponsible playing. See more at www.gamblersanonymous.org.uk. 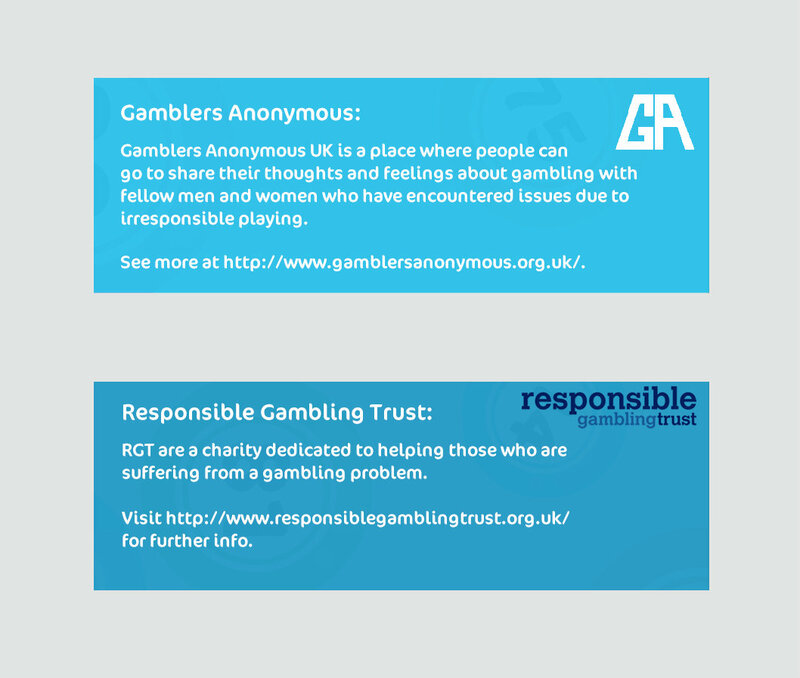 Responsible Gambling Trust: RGT are a charity dedicated to helping those who are suffering from a gambling problem. Visit www.responsiblegamblingtrust.org.uk for further info. When it comes to the act of gambling, it is equally as important to protect the people around you as well as yourself. According to UK law – no person under the age of 18 is permitted to gamble in any way. Given bingo’s reputation as an innocent, family activity, many people falsely assume that it is okay for children and teens to partake. It’s crucial to remember that anyone under the age of 18 who plays bingo is breaking the law and as an adult it is your responsibility to ensure that anyone in your household who falls below the permitted playing age is protected. Bingo is enormous fun – but it is for adults and adults only! The terms and conditions on all bingo sites clearly state that they adhere to the strict measures put in place by UK lawand by agreeing to the terms you are agreeing to prohibit anyone else from using your account. New members will be subject to verification checks and may be asked for proof of age before they begin playing. This is not to cause unnecessary trouble – it is to protect the young from entering a gambling world that at their tender age they cannot fully understand. We implore you to keep anyone under 18 away from bingo sites and the act of gambling until they are old enough. Only then will they be able to appreciate the game of bingo in all its glory – safely, legally and responsibly. Consider all this advice before you play bingo online and we guarantee that you will have a fantastic time from the moment you sign up and make your first deposit.If you ever feel like you need to know more about playing bingo responsibly, do not hesitate to contact one of our customer representatives. Our team will be more than happy to share their insight into the aspect of safe bingo and offer the kind of beneficial support you may need to have a great time playing.